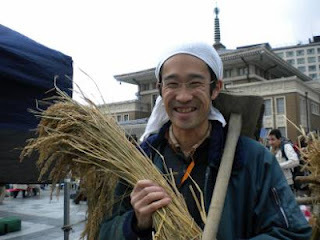 Kazuto-san of Hama Farm at the Nara Farmer's Market. May may well be the perfect month in Tokyo. Nearly everything is blooming, leafing out, and coming to life. Weeds in the garden and at the farm are arriving in droves, and warming up. Insects and other assorted critters are coming along, too, and it's pure joy to watch the tsubame (tree sparrows) swoop and chatter to each other while I work. It also means it's a great time to wander out to one of the many farmer's markets on this month and soak up some of that spring energy for yourself!